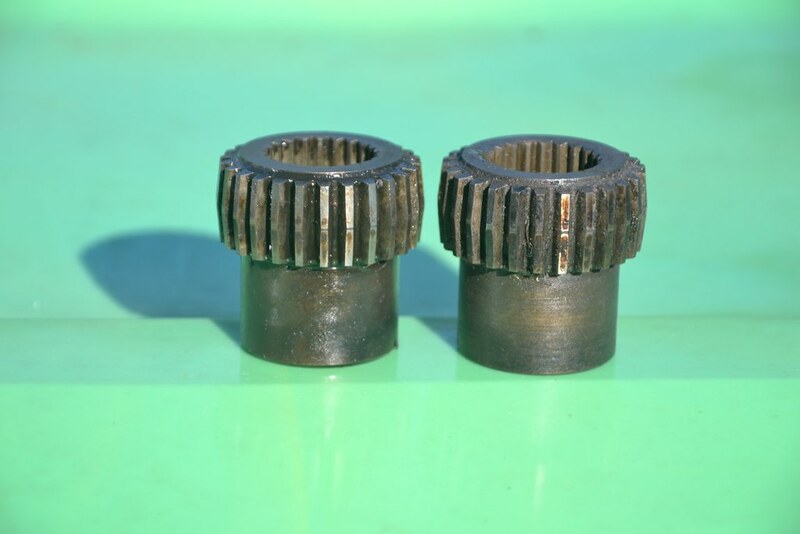 Owning a Gemini usually means you are stuck with a big choice of 2 ratios for your diff in a standard rear axle housing being 3.9/3.89 for petrol or 3.58 for diesel. Even though the diff in TD onwards is a GMH small salisbury the pinion is unique to a Gemini. 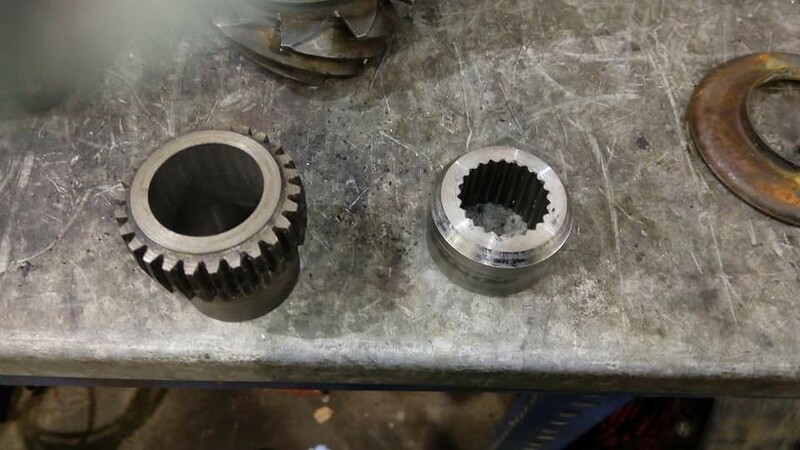 The crown gear, pinion gear and bearings are all shared with the Holden banjo and small salisbury diff but forward of the bearing on the pinion is different. It seams that all “torque tube” style rear axles share the same dimensions ie “spline count, length, diameter and thread” forward of the bearing. 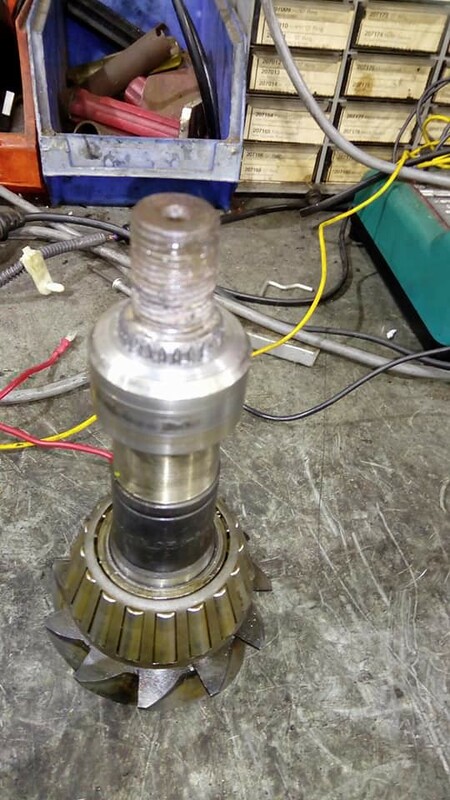 So in order to fit different ratios from a small salisbury or banjo diff of 2.78, 3.08, 3.36 or 3.55 to a Gemini small salisbury diff a custom pinion coupling is required. This is how I made one. I aquired a dead banjo diff with a 3.55:1 ratio and pulled it apart. I pulled a Gemini small salisbury apart to measure against. 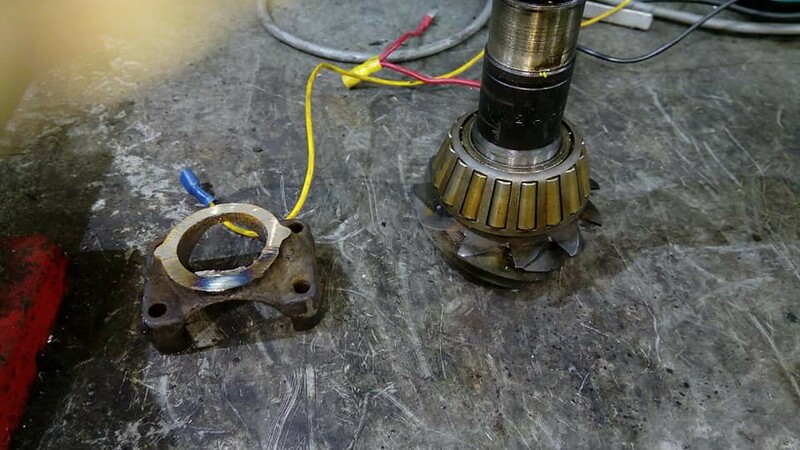 I also had a dismantled diesel diff to hand. 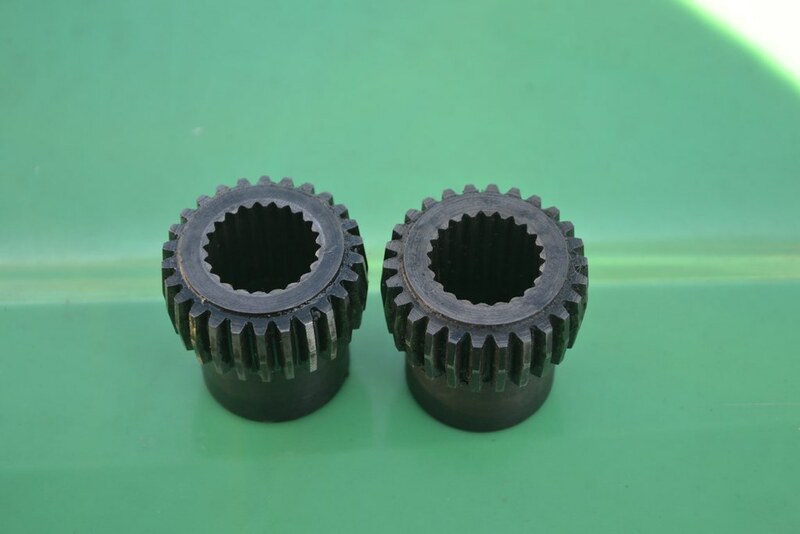 I found that the pinion coupling is identical between Gemini small salisbury and diesel. The spline on the banjo pinion is 23 and very close to the axle splines. The thread on the banjo pinion turned out to be ¾ UNF. The Gemini pinion spline is 22 and the thread is smaller and probably some metric thread. It's the same thread at the end of the extension shaft. 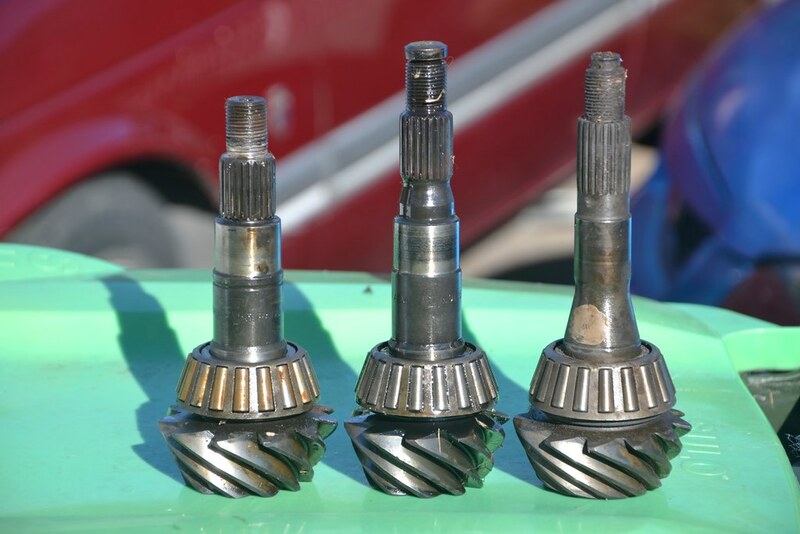 Left to right 3.55 Banjo pinion, 3.9 Gemini small salisbury, diesel pinion. 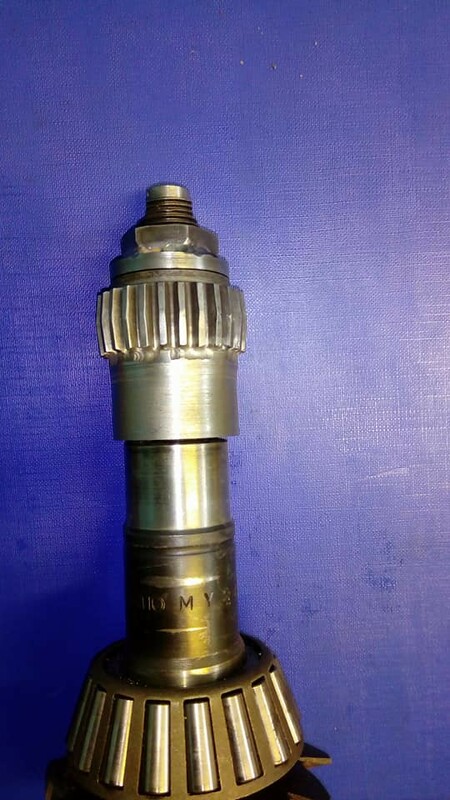 Petrol and diesel pinion coupling. I cut the splined section off the banjo yoke and machined it down to 24mm in length then machined a 45 degree chamfer then probably a 10 degree chamfer close to the centre but not all the way leaving about a 1mm flat before the spline. This was to get weld as far in as possible. Bored the internal spline out of the Gemini coupling out to the same size of the unsplined section of the coupling. Cut the unsplined section off the coupling and machined it back to the start of the external spline. Next I machined up a recessed pinion nut to fit snug down inside the pinion coupling. 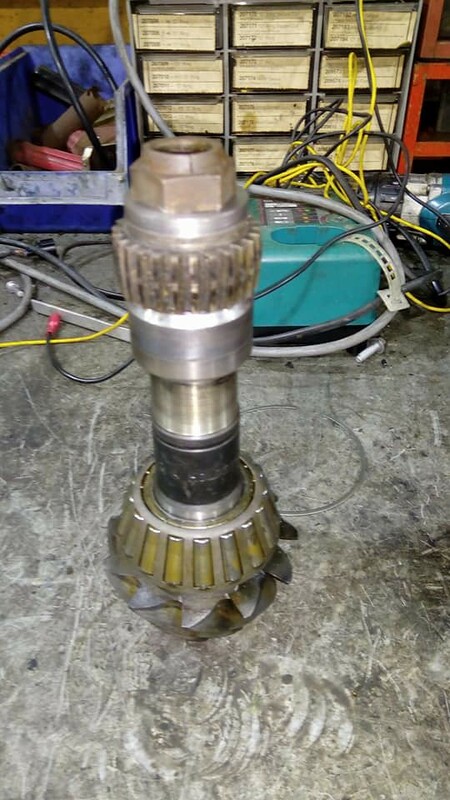 I started with a length of 60mm round bar and turned it down to 35mm which is same diameter as the original pinion nut washer. Drilled a hole through the guts to suit ¾ UNF then tapped the thread. Turned the rest down to 26mm leaving a 4mm shoulder. I found a 2.5mm thick washer and machined the centre out to 26mm. 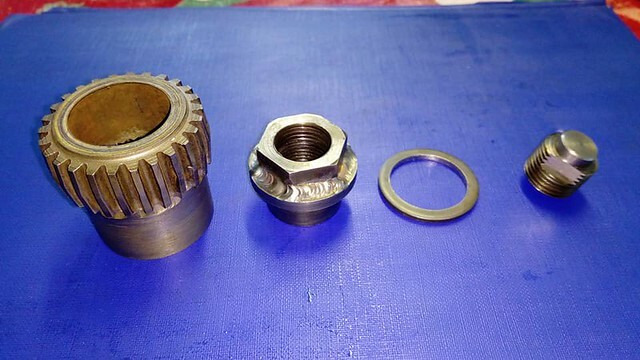 I assembled the whole lot on to the pinion and screwed the original pinion nut on top. It was then professionally tig welded with stainless weld and heat treated. 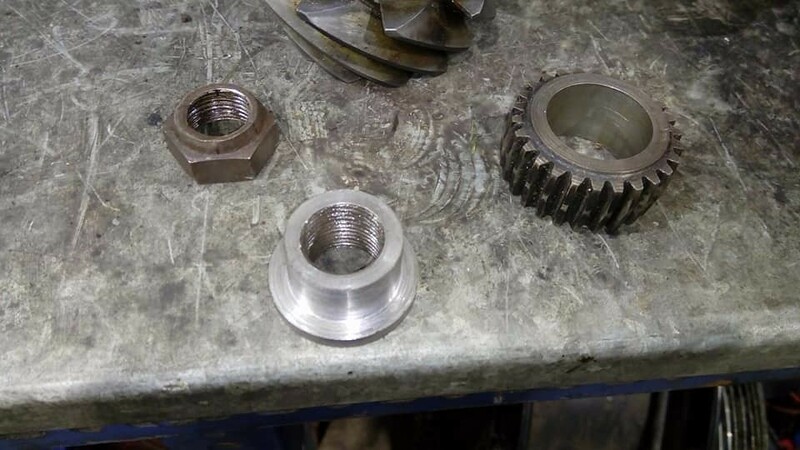 The pinion coupling was welded together and the nut was welded to the recessed fitting. When it all came back from the welder I machined the excess off the banjo part starting at the bottom of the grooves of the outside spline following the slight angle of the splines down to 36mm then out square to the edge. 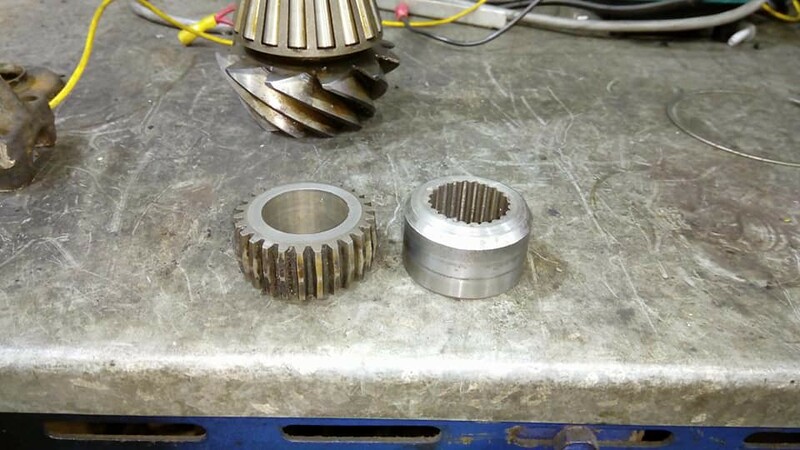 I also machined off the locking part of the pinion nut so it was flat. Next was to make an extension for the buffer cap to sit on. I bought a ¾ UNF bolt and machined one end down to 13mm diameter and 5mm deep. Cut the excess thread off and machined it down to 18mm in length in total. I then ground 2 flats on either side of the buffer cap end at 13mm apart. 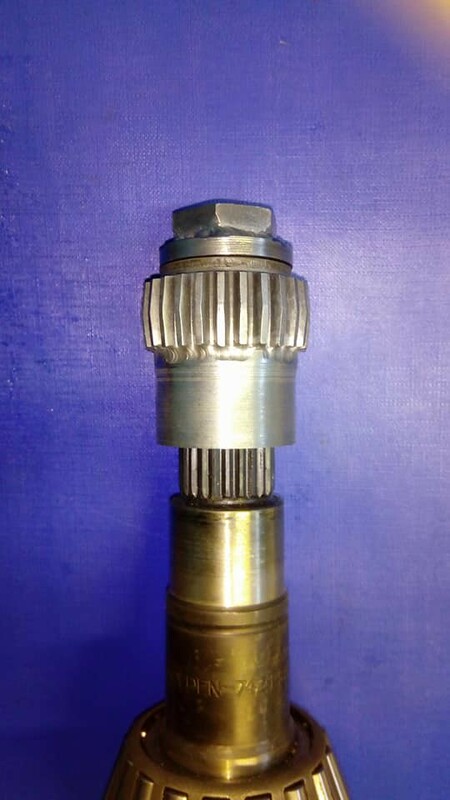 This piece serves 2 purposes, 1 is to have the buffer cap installed so the extension shaft is in the correct position and 2 it acts as a locking device for the pinion nut. So the idea is now that you install a banjo/small salisbury gear set as you would normally using the custom coupling and recessed pinion nut then when the pinion nut is finally done to the right torque you install the threaded extension tightening it with a 13mm spanner to lock the pinion nut. Finally pop the buffer cap on and it's ready to reinstall the extension shaft and tube. Now all it needs is to be tested. Last edited by gemsince88 on Sun Jul 16, 2017 12:14 am, edited 2 times in total. That's awesome impressive work well done!!! You also a nut With tooooo much time!!! Please let us know how it turns out !!! I am going to be sending it up to Coxy as he is going to see if Altra9 will remake it. Hey mate, do you want me to leave this in here or do you want me to move it into the driveline section? Probably better in the driveline section. Thanks. This should be a goer IMHO so we'll see what Darren says! Another option for the burnout bogans. Incredible stuff! I'm interested, if they go well in testing and become available! 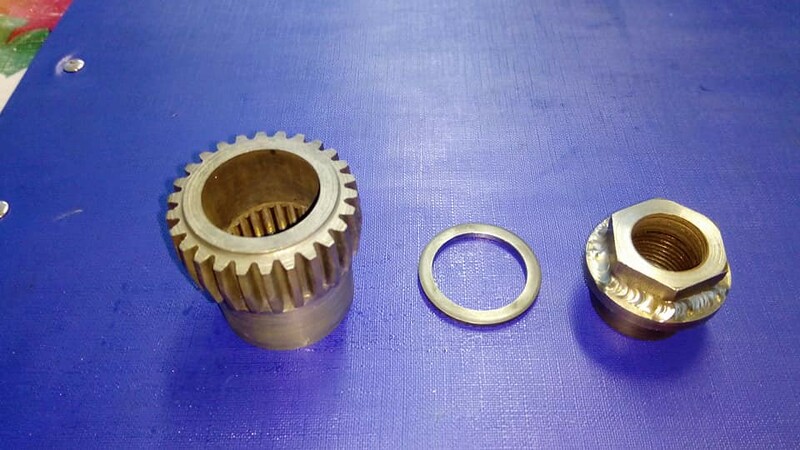 Have you had the chance to check clearance for the pinion gear in the Gemini housing? I mean it should be fine but I made that assumption with Hilux housings and got burned! Is there any lower ratios available? No I haven't sorry. Only had access to the 3.55 pinion and there is bugger all difference. Something in the back of my brain says that the 2.78 will have issues but 3.08 will fit.